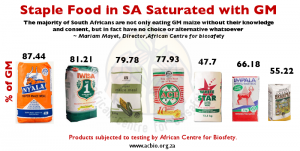 South Africa is the only country in the world that has allowed its staple foods to be genetically modified (GM). Last week, The Journalist illustrated how bread was affected. This week, we take a look at the second staple, maize. 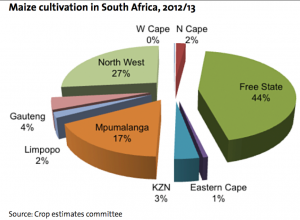 Forty-four percent of the country’s maize is grown in the Free State. The mielie plants that cover the fields with a golden and green blanket may look the same as it always has but now it is very different. Since 1998, it has been tampered with by a process called genetic modification (GM) and only appears to be the same. Dealing with student hunger at the UFS will require an understanding of what they are consuming. The end product, maize, contains various levels of GM that science is showing to be dangerous to human health. “We are outraged that South Africa – the only country in the world to permit the cultivation of genetically modified staple – continues to do so despite a large and growing body of scientific evidence pointing towards severe potential health risks of consuming GM crops, including maize,” she said. Take your pic. The GM doses by product. South Africa is not the only country to allow GM technology. The USA, Brazil, Argentina, India and some European countries allow GM technology. South Africa is unique in that it has allowed the country’s staple foods to be genetically modified. In other countries, the maize and soya is used predominantly for animal feed and for process foods – corn starch, corn syrup, soya flour, soya lecithin. 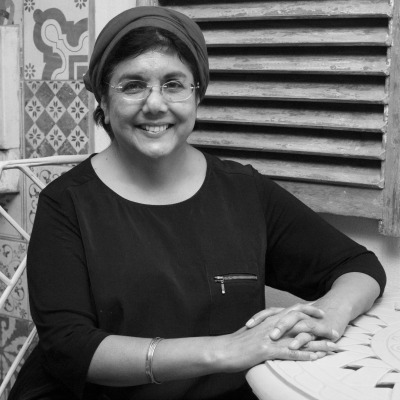 “GM foods are not consumed as a staple by millions of people every day except in South Africa,” said Zakiyya Ismail, Consumer Campaigner for the African Centre for Biosafety. How did this come about? She explained that the direction was driven by industry itself. “Our new government was not equipped to be able to assess GM technology and there was no civil society engagement in the process,” she said. Research into genetically modified (GM) crops had been taking place in South Africa since 1979 under the now defunct South African Committee on Genetic Experimentation (SAGENE), she said. SAGENE continued to act as regulators until the GMO Act (which had principally been drafted by SAGENE members) came into effect on 1 December 1999. “Many of SAGENE’s members had close links with the biotechnology industry and were nominated onto SAGENE by the South African Chamber of Business,” she said. In 1997, two years before the GMO Act was passed, South Africa’s young democracy agreed to a technology that the rest of the world was extremely cautious about – genetically modified crops. Since the beginning of 2008, the South African government has granted close to 1 200 permits for GM maize experimentation, cultivation, import and export. ‘Adoption by our commercial maize farmers has been rapid, with 86% of the 2012/13 season maize crop being genetically modified. As with bread a few key companies control production. Milled maize products, Ace, White Star and Iwisa Super Maize Meal belonging to Tiger Brands, Pioneer Foods, and Premier, respectively, constitute over 73% of the maize meal market respectively. These three major food producers also control the milling of 60% of the nation’s white maize crop. “This kind of control in the market is highly profitable for the producers,” said Ismail. Food activists who will gather for a national dialogue in November are calling for an urgent reversal of this economic concentration. They want mechanisms to be put in place to develop and nurture small players throughout the maize value chain, from farmers to millers and retailers. This should include the promotion of agro-ecological production methods, decentralised value chains and public maize breeding programmes that provide access to seed that can be freely shared and exchanged. “We need a socially just food system,” said Ismail. Efforts to reach the Free State Department of Agriculture, Forestry and Fisheries have been unsuccessful. The poorest are paying the most for their staple foods. 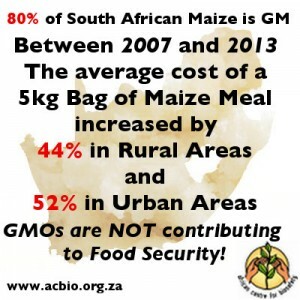 The African Centre for Biosafety has written an open letter to the National Chamber of Milling (NCM) asking for clarification of its relationship with AfricaBio, to push for a stringent and accurate labelling and identity preservation system (including establishing GM free maize and soya chains) and supporting the independent, long term and transparent risk assessment of GMOs in South Africa.